Lower humidity levels and temperatures in the high 70’s and low 80’s have been much appreciated this week. A windy warm-up is forecast for this weekend with highs approaching 90 degrees Fahrenheit, but thereafter high temperatures should remain in the mid- to upper 70’s and lows should be in the mid- to upper 50’s. Around 0.7 inches of rain fell in St. Peter earlier this week, but as the weather looks pretty dry through next week we might have to bring out the watering cans to our gardens. This last full week of August brings the summer months to an end, and thanks to the abundant rainfall in June and early July our gardens are looking as showy and lush as ever; even our Kentucky bluegrass lawns are showing few signs of water stress. A few trees have begun to convey fall colors in the Linnaeus Arboretum, including both red and sugar maples behind the Interpretive Center. Staghorn and smooth sumac leaves have begun changing from deep green to blood red in color; these are among the first leaves to show the effects of senescence each fall. Overhead, a few monarch butterflies have been sighted flying south as green darner dragonflies (the only other truly migratory insect in North America) and swallows begin swarming and flocking, respectively, as precursors to their southward mass movements. 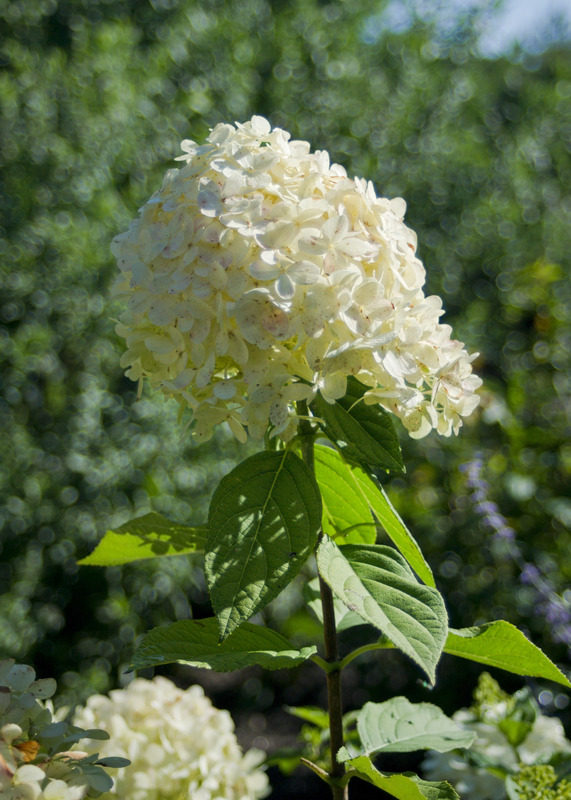 Hydrangea 'Limelight' blooming in Thornberg Garden on east side of Interpretive Center, 8/26/10.